21 February – Birregurra. 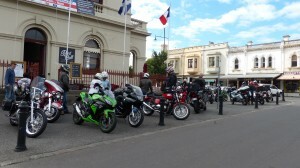 Led by Ray L.
6th Classic Ride to Bacchus Marsh all welcome. 3rd Bikes By The Bay – Bike Show. 1st classic Ride to Little River all welcome. 15 May – Ride to Moto Bean Café, Malmsbury. Ride to our Christmas Party.